The handy key board for the selection of the various functions. The possibility of automatically correcting errors in measurement due to temperature and the extreme simplicity of regulation all serve to permit a rapid and reliable execution of calibration and measurement. The display on the front panel reveals the temperature. PH or mV reading taken by the instrument. 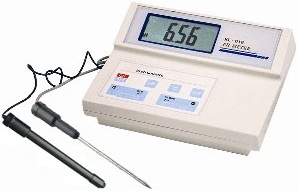 The instrument comes supplied with a combined PH electrode and a probe for the measurement and compensation of the temperature.